The two most basic requirements for chickens are a house to roost in at night and a safe place to scratch around in during the day. It’s important to think about the siting of the hen house/run (some shade is good and avoid low lying boggy areas) and remember to take your neighbours’ feelings into consideration. A good hen house should be free from draughts, but at the same time well ventilated, and provide shelter from rain and vermin. You should avoid overcrowding and allow one nest box for every 3-4 birds. In addition, each bird should have adequate perch space (9-12 inches each) for night time roosting. A good hen house equals happy hens and lots of lovely eggs! The Common Earthworm (Lumbricus terrestris), is easy to digest, high in protein and loved by all sorts of birds, such as blackbirds and thrushes through to gulls, curlews and even buzzards. In addition, mammals such as hedgehogs, shrews, moles and badgers like nothing better than fat, juicy earthworms. They are also loved by fish, as many a fisherman will testify to. Historically, humans (and not just inquisitive babies!) ate worms. There is a book called “The Worm Book: The Complete Guide to Worms in Your Garden” by Loren Nancarrow and Janet Hogan Taylor that has a whole chapter (admittedly only 2 pages long!) devoted to the preparation of worms for eating, followed by tasty (?) recipes. Mix all the ingredients together and place in a loaf tin. Bake for an hour at 200oC/400oF. 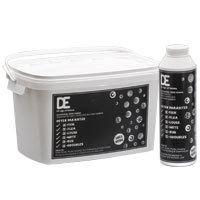 Diatomaceous Earth (or DE powder for short) is a completely natural internal and external parasite control for birds, pets and livestock along with things like purifying water and polishing metal. It is produced from diatomite, which is a sedimentary rock composed of silica shell remains of single-cell aquatic plants called diatoms. The woven composition of the shells of the diatoms means that they soak up huge amounts of water, oils and smells. DE powder works on parasites by sucking the liquids and lipids from their skin causing them to dehydrate and die. For all you chicken owners out there, DE powder is perfect for controlling red mite in your poultry houses. Just use the puffer bottle to disperse the powder, paying particular attention to corners, the underneath of perches and nest boxes. In addition to being used for external parasites, DE powder can be used as a feed additive to reduce or eliminate parasitic worms in the guts of animals. For chickens add 5% to their daily rations, cats/small dogs 1 small teaspoon per day and large dogs (over 25kg) 1 tablespoon per day. DE powder is also great for use in wormeries as it keeps flies at bay, but doesn’t harm the worms. As the "Season of mists and mellow fruitfulness" (John Keats) approaches fast, I am eyeing up the hedgerow gifts that my paddock has to offer. The hazelnuts are coming on a treat and the elderberries are ripening fast. So with this in mind here are a couple of excellent elderberry recipe ideas from the fantastic book “Fruits of the Hedgerow and Unusual Garden Fruits” written by Charlotte Popescu. 225g (8oz) Elderberries, washed and stalks removed. Put the elderberries and apples in a baking dish with the water and add the granulated sugar, turning the fruit over as you do so, to distribute the sugar evenly. To make the crumble whiz the flour, butter, sugar and hazelnuts in a food processor until the mixture resembles breadcrumbs and then spread over the fruit, patting it down gently. Bake in the oven at gas mark 4, 180oC (350oF) for 30 minutes. 675g (1½ lb) Elderberries, stalks removed. Put the elderberries, onions and apples in a large saucepan. Add the spices, salt and half the vinegar. Bring to the boil, then turn down and simmer for 30 minutes. Add the granulated sugar and the remaining vinegar. Stir until the sugar has dissolved and then simmer until thick, stirring to prevent sticking. This should take about 40 minutes. Spoon into warmed jars and seal. Try to keep for 6 weeks to mature.